Don’t miss this week’s installment of the MTG Fast Finance podcast, an on-topic, no-nonsense tour through the week’s most important changes in the Magic economy. In an effort to be more proactive, Wizards has seen fit to remove Krark-Clan Ironworks from Modern. Reviewing the precedent set with past combo bannings, such as Second Sunrise, this is certainly a decision made sooner than may have been anticipated. This could point to a desire to more quickly shuffle cumbersome combo decks out of the format in the future. We’ve no doubt that they came down on KCI much quicker than other decks that were more pervasive but less “tournament-unfriendly.” We’ll be wise to keep that in mind in the future should any other of these strategies arise. I’d love to detail all sorts of Modern specs that have been given new life by KCI’s departure, but to be honest, there isn’t anything terribly clear or obvious. Other combo decks may show up in greater numbers again — Tron comes to mind — but any price activity is likely to be shallow enough to not represent a worthwhile investing opportunity. So instead we’ll think about Ravnica Allegiance today, and some of the new commanders that set has brought us. To begin, we’ll look at Teysa Karlov. Teysa decks are in their infancy, but that doesn’t mean we can’t begin to see where the strategy is going to head. Athreos’ spike a week or two ago means other people are figuring it out already as well. There’s three basic levels to Teysa. Level one, cards that reward you for things dying. Level two, ways to sacrifice those creatures. Level three, card draw to make sure you can keep doing those two things, since by it’s nature the deck is going to cannibalize its own board. Krav sits comfortably in both levels two and three. On-demand sacrifice effects are often underappreciated in EDH. Their utility extends to an untold number of corner cases. Drawing cards and gaining life are of course both great as well, and need no championing. If you’re building a Teysa deck, it’s tough to imagine Krav doesn’t make it in. Krav is of course from Battlebond, which means a single foil printing. Supplies are mediumish, with less than 50 copies on TCG, and basically none in stock at sub-$12 prices at direct vendors. Should Teysa prove to be a popular commander, I expect the supply on Krav to run low quickly. We’re looking at a summer set, that didn’t have excess demand to drive multiple print runs, that’s been out of the public eye for awhile. Inventory is latent, but new demand will drain it quickly. 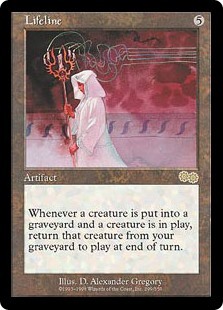 Another Teysa hit, Lifeline is a very old rare, all the way back from Urza’s Saga. (One set before foils, unfortunately.) Lifeline’s text is a tad clunky, which may be why adoption rates to date have been relatively low. Basically, if any of your creatures die and there’s still A. Lifeline and B. another one of your creatures on the battlefield, the dead creature is reanimated at the end of the turn. What this means for you is that you can do things like use Yahenni’s ability to make him invincible, sacrifice your entire board to various value effects, and then return them all back to play at the end of the turn because you have A. Lifeline and B. indestructible Yahenni. You can certainly get blown out, but even still, it’s a powerful line. It’s even sillier with something like Grave Pact or Dictate of Erebos in play. As I said, Lifeline hails from the time before foils, so that’s not an option in this case. We’ve got different assurance though, as Lifeline finds itself on the reserve list. Normally we like foils for EDH since they can’t show up in precons, but in the case of RL cards, that’s not an issue, so the foil isn’t quite as important. Still, a new commander that specializes in death in a way no other commander really has could be just what Lifeline needs to go from virtually nonexistent to niche gem. That’s not a recipe for booming demand, but when we’re talking about a card that’s what, 21 years old, supply and the ravages of time are on our side. Like Krav, we’re not likely to see movement if Teysa isn’t popular, but if she is, this could be a major component of aggregate decklists. 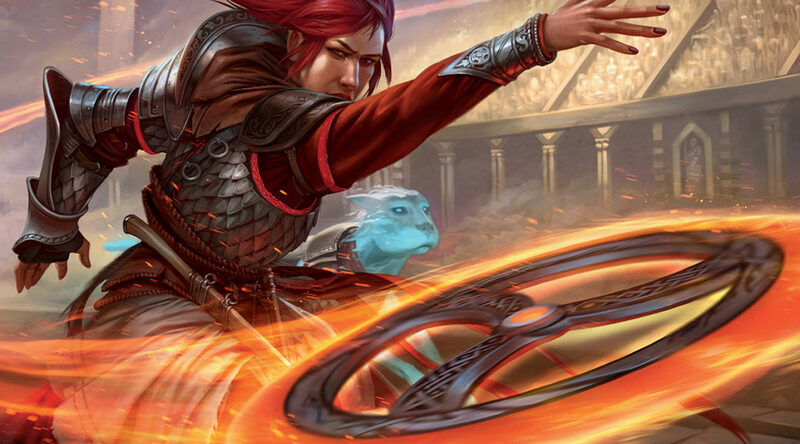 We’ll wrap up by looking at a different Allegiance commander, Nikya of the Old Ways. 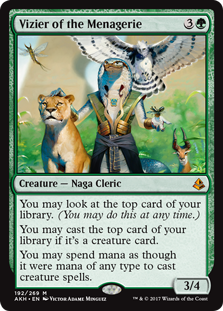 Nikya wants you to play absolutely nothing but creatures, and rewards you by functioning as a walking Mirari’s Wake. How do you make the best use of this? By putting yourself in situations where you can cast hordes of creatures fast and hard. Lucky for you, Vizier does just that, as every creature on top of your deck is akin to drawing a card. Unlike Lifeline an Krav, Vizier already has a base in EDH, with over 4k decks registered with a copy. That’s not remarkable in its own right, but it does give us an idea that there’s already a segment of players generating demand. 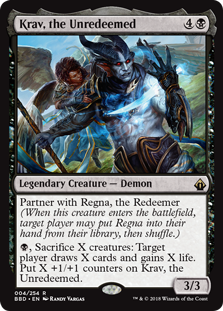 A new commander that is definitely going to be after this effect stands to accelerate drain on a surprisingly limited supply. Checking in on TCG, there’s roughly 30ish NM foil copies, starting at $8 and ramping to $10, and then $15 quickly. Other vendors are already out of stock, or are priced north of $15. Even without Nikya I’d like this as a spec, although admittedly it looks like it may be a slow burner. Hopefully Nikya drives a few people to to snag their copies and accelerates the drain on the existing supply, which would position you to turn a 12 to 24 month spec into a 3 to 4 month spec. Travis Allen has been playing Magic: The Gathering since 1994, mostly in upstate New York. Ever since his first FNM he’s been trying to make playing Magic cheaper, and he first brought his perspective to MTGPrice in 2012. You can find his articles there weekly, as well as on the podcast MTG Fast Finance. So in short, anyone with creatures that die end up getting them back as long as there’s “a” creature on the battlefield when it dies.